The spring credentials for the database and rabbitmq can be kept the same if no changes were made during the container deployment process in the setup of the infrastructure host. Just in case the VISP Runtime is executed on a host different from where the runtime is running, it is possible to specify the database IP manually. This is possible by creating a database.properties file in the application root that contains the IP of the host where the MySQL server is running. In order to configure the resource requirements of the individual operators, it is required to define them in the operatorConfiguration.json file. The easiest way to run VISP is by using a docker image. Once the infrastructure host is up and running, a resource pool needs to be created. Resource pools are basically cloud computing instances where docker containers are executed. Open the web interface of the infrastructure host (http://<infrastructureHost>:8080/) and navigate to Resource Pools. Initially, there should be no entries. Create a new pool by clickin on the Add new pooled VM button and specify a name, an instance flavour and a cost. The name is an identifier and is also used in the topology config file to distinguish different pools on the same runtime instance. The flavour reflects the amount of computational resources available and basically limits how many operators can be deployed at the same time. The cost value is currently not used. Topology files are used to describe which processing nodes should be deployed and how they should be connected. 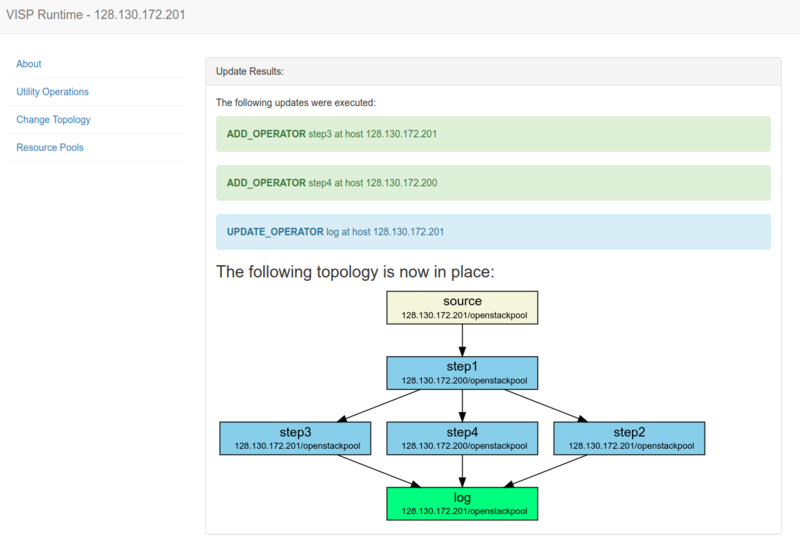 In order to upload a topology file, navigate to the web interface of the infrastructure host (http://<infrastructureHoste>:8080/) and select Change Topology. There you can upload a new topology file and see which topology is currently active. If the nodes should be deployed on multiple VISP runtime instances, just upload the topology on one runtime instance - VISP’s distributed update process will take care of the rest and update the other runtime instances accordingly. Here are two example topology files: scenario1 and scenario2. Importantly, the IP addresses of the VISP runtimes need to be adjusted. In both cases, the operators are deployed on different runtimes to show how to specify such a behavior. Of course it is also possible to deploy all operators on one single VISP runtime instance (the only limitation is the number and size of resource pools specified). The above figure shows the result of a topology update where six operators (one source, one sink, four processing operators) are deployed on two different VISP runtime instances. The automatically generated graphic shows the runtime instance and resource pool where each operator is deployed. In order to evaluate whether the set up topology is actually working properly, we have developed the VISP Data Provider tool. This tool allows automatically generating input data for a configurable VISP runtime instance. There, enter the public URI of the VISP Runtime where the target source operator is located. E.g., if the source that should be addressed is deployed at a VISP runtime 128.130.172.222, enter that IP. Username and password are the credentials for the rabbitmq server that were set during the docker deployment of the infrastructure host. Once the credentials are configured, navigate to Create Task, pick a template (e.g. SequentialWait) and specify the frequency and number of iterations. The template decides which queue is targeted and what kind of data is sent. To see whether the generated data is processed correctly, you can open the rabbitmq web interface on the corresponding infrastructure hosts. For example, navigate to http://128.130.172.201:15672/#/queues (replace the IP with the actual infrastructure host). The first part represents the sending operator’s VISP runtime IP. Separated by a slash follows the sending operator’s ID. Finally, a greater than sign precedes the receiving operator’s ID.